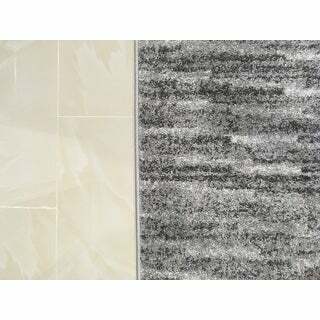 Made for plush durability from a polypropylene blend, this stylish area rug from Porch & Den is a beautiful and lasting addition to any home. 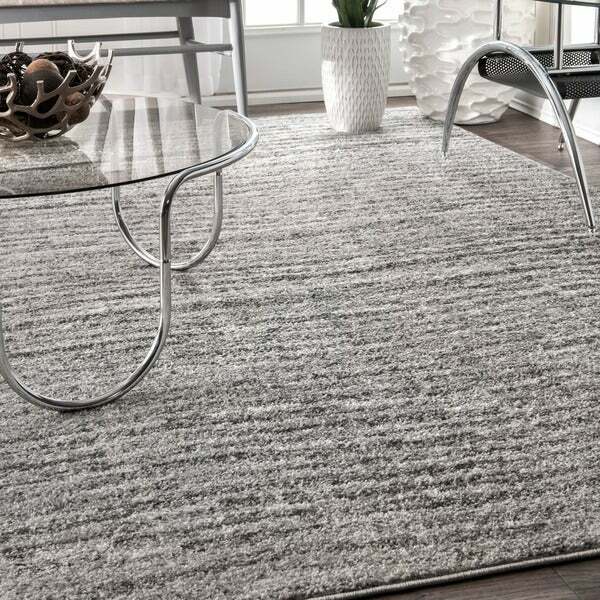 A charming wave pattern rendered in shades of grey allows the rug to lend movement to any decor. The rug is latex free and easy to clean for your convenience. 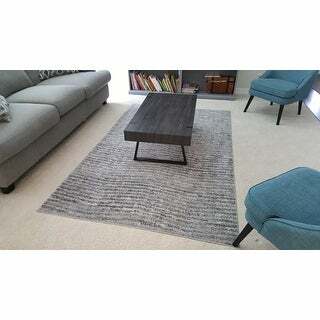 Option: 7' 6" Square | 8' 2" x 11' 6"
I ordered this rug for our new home, along with the same in a different size, which hasn't arrived yet (that's another story, which isn't at the fault of Overstock). When I unrolled it, it looked smaller than what I was expecting, and found that it was only 8'2 x 11'6. 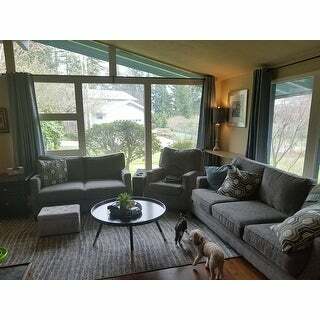 I looked at the tag on it, which confirmed the 8'2 x 11'6 measurement, and saw that the rug is by nuLoom (which is the same as the 7'6 square one I am waiting on) and not Porch & Den. 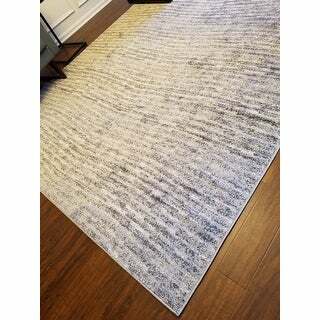 I'm speculating that there's been a change in the manufacturing of this rug, or something, because I can find the same rug being sold under nuLoom on other websites. The rug will still work for the area that I planned on using it, but it's misleading when the product is listed at a size that is 4 inches different. Other than that, the rug looks nice. The color is a tad lighter/whiter than the pictures show, and it is thin, which is fine because it is soft. 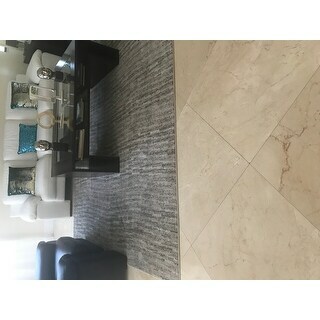 Option: 8' 2" x 11' 6"
Looks like a light gray almost silver color in the picture online. It's actually darker, more like a charcoal with light gray mixed in. It would be helpful if there were a more detailed picture online. I purchased this rug for our den. I wanted something dark with a slight pattern for interest. This rug is perfect! The “waves” in the design add just the right touch. 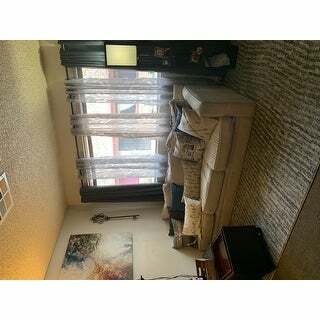 Great rug for the price! This rug is soft and lays beautiful! The different shades of grey are perfect for many rooms with different colors. Very pleased with the quality and color. Matches with our grey walls and white woodwork beautifully! I think for the price, this is a good rug. The rug is a little lighter than I thought it would be, so I'm not all that pleased with the way it looks in the room I bought it for. BUT, I do like the rug enough that I will be putting it in a different area of my house. Another mistake on my part was not sizing up... should have spent the extra money to do that. Otherwise, like I said, for the price this is a good buy. The rug vacuums well, seems of the right quality for what you're paying for &amp; looks nice! I had my eye on this rug for a while when I started planning out my home office. My color scheme was mostly black and white so I wanted a rug that was muted but added a little bit of color. 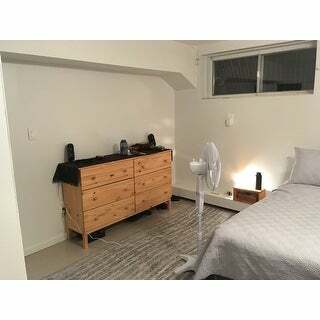 It's a small room so I didn't want anything dark enough to make it appear even smaller, so the reviews scared me a bit. It was exactly the color I was expecting though, I definitely wouldn't call this 'charcoal.' 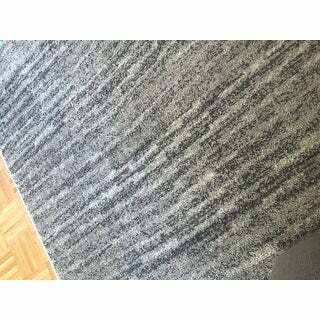 I think it's more of a heather gray with some streaks of dark gray, but overall its a LIGHT gray rug. It's plenty comfortable on the feet for a home office; not cushy but very soft. I think it's a great buy for the price, I love it. I love this rug so much! The pattern is beautiful and it's incredibly easy to clean, especially if you've got a Roomba. It's durable and hides pet hair really well (i.e. it's been Husky-tested). Looks like a lighter grey in online photos. Pretty thin rug sift but not cushy. All there is a lot of off gassing (look it up if you haven't heard of it). We determined this wasn't safe in our home. This rug was a great buy, but you do get what you pay for. 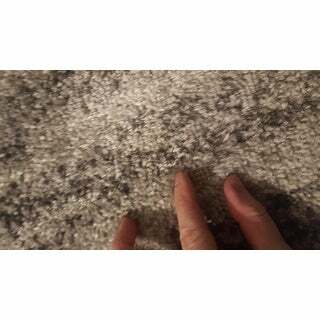 The pile is thin and feels very synthetic, although it is soft.The rug is close to as pictured. I do not find the contrast between colors to be to harsh as some reviewers have suggested. I do believe it looks a bit darker in color than pictured. Although a bit darker than expected it does look nice with the other shades of grays and blues in my living room. Its not super fancy but it looks nice and feels adequately soft. Not very much cushion to it, but we have it over carpet so that didn't matter much to us. One thing I appreciate it is that it doesn't leave little fibers all over. I can sit on it with black pants without having to tape myself off afterwards. That always annoys me with other rugs. This is not a bad rug, but you can tell that it is not a quality rug. I put a really good thick pad under it and still not a lot of cushion under your feet, and not soft. It will do for now, but not at all what I want!! Fast shipping, came very nicely packaged. 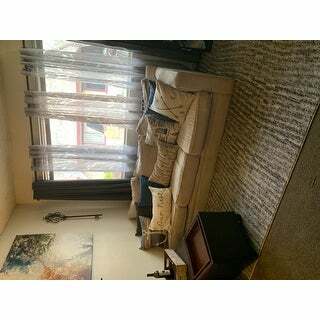 Looks great with the light grey and white bedding we have and accents well with the dark hardwood floors. Wish it was more of a standard size though. 5 stars if it was 8x10. I am very disappointed in this rug. The picture is not at all indicative of what the rug really looks like. In the picture it looks almost solid but in fact is way more variegated. I have been pleased with previous rug purchases but not this one. And to add insult to injury I guess I didn't pay close enough attention because I didn't realize return shipping would cost. I will take a loss of $** + dollars to return it! Option: 2' X 3' | 5' x 8' | 8' 2" x 11' 6"
Overall: Fast shipping. Excellent quality. it's a LIGHT gray rug. I purchased 3 different sizes at 2*3, 5*8 and 9*11. It's plenty comfortable on the feet, not cushy but very soft. I think it's a great buy for the price, I love it. Poorly made and would not buy if you are looking for a quality rug. We got the rug and there are a couple holes where fabric didn't come through. I like color, but disappointed with my purchase. More silver than expected, and pile is skimpy. I sent it backend hope I am able to find a better carpet. Fortunately I ordered a smaller size than needed so I could see if I liked it. Return was simple- Overstock has very good customer service! Great Rug! Love the fact that Roomba rolls over with ease. I absolutely love the rug !! I purchased the 9' x 12' rug to put in my bedroom under my queen size bed, the rug itself was a little bit lighter in color than I expected but it still looks great! I have a black lab and was hoping the color combo would help hide some hair in between vacuuming, which is working great. Very happy with the purchase, the fast delivery, and the overall product! Disappointed. 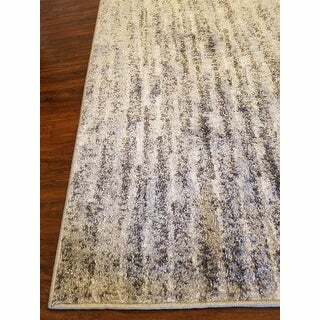 The rug is too thin and it looks like a stray dog fur... Too thin and very gray with black. The knit is far apart. Bought three different sizes: a runner, 3x5 and 9x12. The return cost for only one piece (the small one) is higher than the purchase price. I guess I am stuck with them for now. Will try to add thicker underlayment, if this will give any softer feel to the rugs, although the good pads are as expensive as a small rug. Great quality! Looks great in my house! "Does this rug come larger than 10 x 14/ 12 x15? I am looking for something closer to 15 x 19." "Does this have some white/light color/texture in it? Or is this all one color throughout? Does anyone have a pic they can post? Also, is it a light Grey or dark grey? Thanks!" "Is this rug more of a silver or grey with charcoal?" It is more grey/ beige mix of colors to mix and match any space. This is more of a gray with charcoal. Not much silver, there is a tad bit of white woven in too. This rug is 100-percent polypropylene, which is soft. It's soft but not very plush. It's pretty thin. "It says this rug is 10x14 but in the specs it says 7x9 - which size is it?" The rug is 7 feet 6 inches x 9 feet 6 inches. "The listing states the size as 10' x 14' but in the product description it says it is something much smaller. Which is correct?" It is very much same in size similar to 11x13. Its big and I have it in my dining room. Looks very similar to picture. Nice rug. It is NOT 10x14. I complained after measuring the rug and they should be correcting the headline. It is the smaller size in the description. "What size box does this come shipped in?"